Daily Illuminator: Oz-Some! Munchkin Oz And Oz 2 In Stores Now! March 21, 2017: Oz-Some! Munchkin Oz And Oz 2 In Stores Now! The magical land of Oz is closer than you think - in fact, it's at your local game store right now! Like a displaced farmhouse, Munchkin Oz has dropped into stores, full of merriment, mirth, and (of course) munchkins! Team up with the Tin Woodsman and backstab your buddies while fighting off The Nome King and Wheelers. You can even mix it with other Munchkin sets to make your own mash-up! Check out this article about combining Munchkin Oz with Munchkin Grimm Tidings and Munchkin Legends Guest Artist Edition for a literary throwdown! 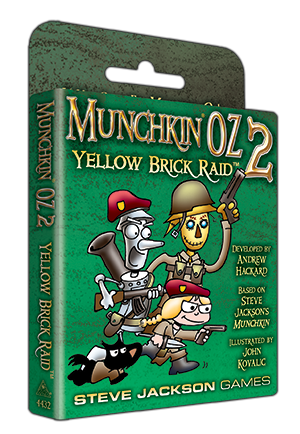 And if you're looking for more adventures in the Emerald City, look no further than the brand-new Munchkin Oz 2 – Yellow Brick Raid! This new expansion delves into the multitude of books that aren't named after a wizard in L. Frank Baum's Oz series, and boy, are there a lot! Add Glinda's Ring to your arsenal to take on The Lizard of Oz! And don't forget to stop and taste the Lemonade Rain and Popcorn Snow! These games aren't in Kansas any more; they're at your friendly local game store! Pick them up today!